Well I never! I'm a good enough plane spotter to tell a Lockheed Hercules from an Antonov An-12 a long way off, so I was very surprised to see a 'Fat Albert' inbound to land at Okęcie's runway 33. What surprised me more was to see that it was an RAF rather than a USAF aircraft. I can't say I've ever seen an RAF type flying into Okęcie; USAF planes do show up from time to time. The aircraft above is C130K XV305/305. 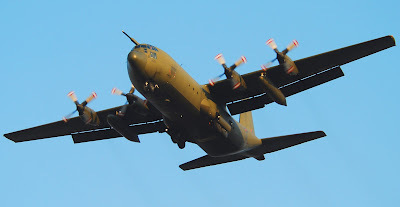 A bit of research and I discover that another RAF Hercules (XV197/197) had visited Warsaw less than two weeks ago. And click here to see one I photographed flying over Matlock Bath in Derbyshire last August. 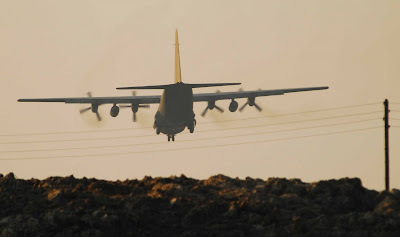 Below: the Herc goes over the fence to land at Okęcie.